The AATA gambles the farm in a push toward a transit system that will reach countywide and beyond. 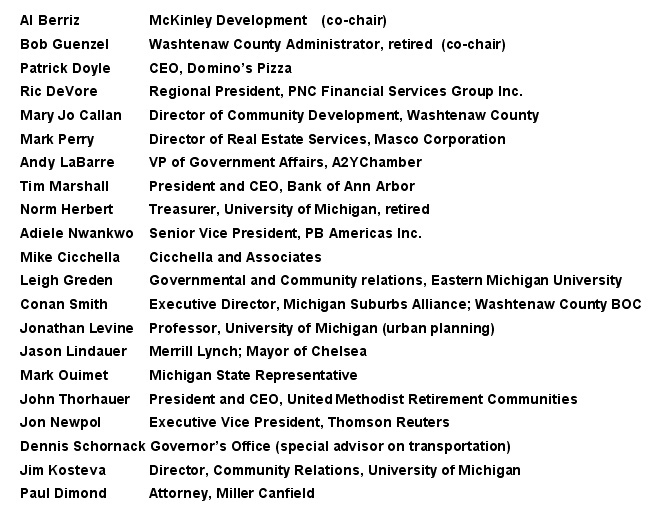 As we have been documenting for a couple of years (see the Transportation Page), there are multiple efforts ongoing to bootstrap Ann Arbor and Washtenaw County into a strong, complex, interconnected transit system. 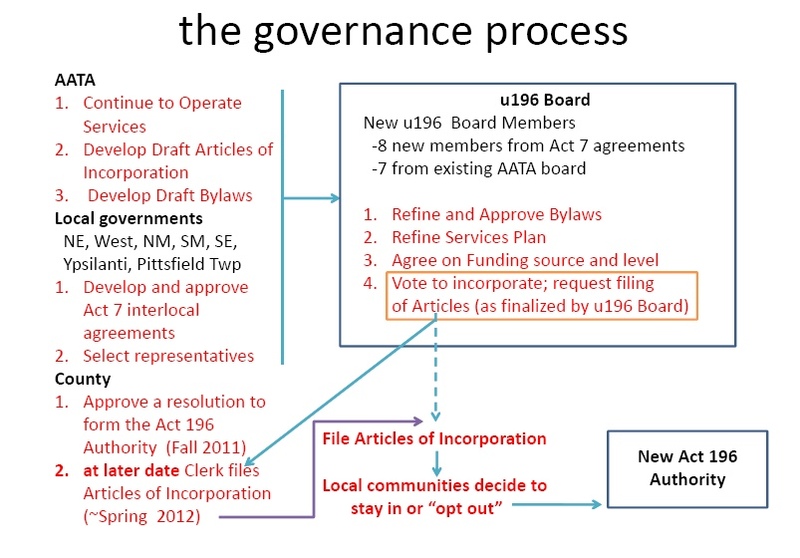 Many (but not all) of these efforts are incorporated in the Ann Arbor Transportation Authority’s push to become a regional transportation authority (see their website, Moving You Forward). Actually, the AATA has served as something of a regional transit system for years. Though it is chartered and substantially funded by the City of Ann Arbor (reviewed in our post, AATA Yesterday and Tomorrow), AATA has run buses into neighboring communities under POSAs (Purchase of Service Agreements) in which the extra-city area governments have paid for the service. But now, as AATA Board Chair Rich Robben has said (quoted by the Ann Arbor Chronicle), the AATA will venture into deficit spending as a “catapult” to achievement of its Transit Master Plan. The AATA is, in fact, reaching even further than the TMP. An article in AnnArbor.com enumerates the many different moving parts incorporated into this year’s budget (the reporter, Ryan Stanton, evidently pulled these from the Work Plan; I have not verified the accounting). One eye-opener in the budget (see the full document here) is $1,116,900 to purchase service for a shuttle to the Detroit Metro Airport. In addition, there is $10,000 budgeted to market this service, which has been a major preoccupation of board member David Nacht in recent months. 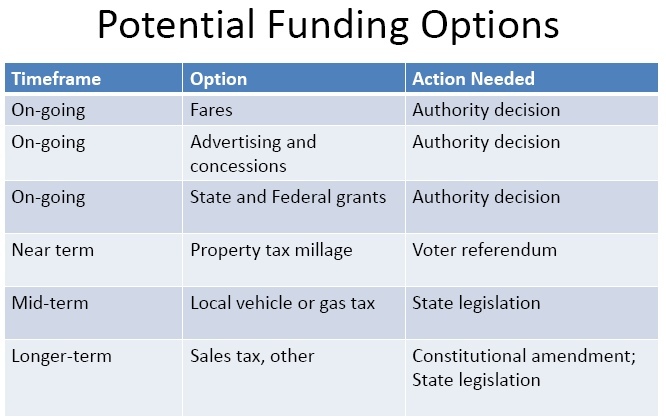 But much of the overextended budget is related to two things: the expenditures made to establish a county-wide transit organization under Act 196; and significantly, implementation of portions of the Transit Master Plan in advance of obtaining countywide funding or other funding external to Ann Arbor. The board authorized release of the TMP in June. (See the summary by the Ann Arbor Chronicle and our brief discussion.) Much of the formulation of the TMP and its further moves towards operation have been under the aegis of a consulting firm that is based in London (England). See the discussion recorded by the Chronicle about the vote to extend the contract for that firm, Steer Davies Gleave. The path from here to there is complicated, but has been carefully laid out. In August, the AATA board released the third volume of the TMP, the funding report. (See links to this voluminous report on the Chronicle’s account of the meeting.) They also released the names of the financial committee who are tasked to review options for funding the ambitious TMP. It is a roster of the powerful and influential. Given the alternatives, I thought that the finance committee’s chief function would be to bless and promote a county-wide millage campaign for the fall of 2012. This was further supported by a remarkable exchange that occurred at a September Planning and Development Committee meeting where the anticipated deficit budget was discussed. The following is a paraphrase, not an exact quotation. It followed the explanation by Phil Webb, AATA controller, about the deficit budget, which would entail dipping into reserves. Rich Robben: We won’t be able to follow this mechanism (dipping into reserves) next year. We’d better pull some rabbits out of a hat. Michael Ford: I’m looking at finding some rabbits. Phil Webb: There will be a gap between September 2012 and July 2013. Explanation for that last comment: if a vote over the entire county is held in 2012 (most likely in November) that affirms a new millage, that will not be levied until the 2013 tax year. This means that until taxes are collected in July 2013, no revenue would be available. (We explained some of this at length in a post about a city income tax.) But the AATA, which uses the Federal tax year (October-October), would have to pass a new budget in September 2012 in advance of the millage vote. So not only will the AATA have to pass a new year’s budget without a certainty that a countywide millage will pass, but three-quarters of a year will pass before revenue will be realized from a successful millage vote. But wait! It gets more exciting. The story will continue. This entry was posted on October 29, 2011 at 9:30 pm and is filed under civic finance, Transportation. You can subscribe via RSS 2.0 feed to this post's comments. You can comment below, or link to this permanent URL from your own site. Vivienne, I was reminded today that when President Dwight D. Eisenhower proposed the Interstate and Defense Highway system in the 1950s, the plan was supported by both parties. Yet no funding had been identified and the nation was deeply in debt because of World War II and the Korean War. Eisenhower’s was a visionary concept, and its implementation has changed in profound ways how Americans live. Nobody knew how much it would cost, and the final tab turned out to be about $1.2 trillion (according to the Federal Highway Administration’s tally in dollars unadjusted for inflation). Major societal advances are seldom led by accountants. Whether or not you “like” the Interstate system, it can’t be denied that it brought incalculable economic benefits. When people saw the benefits, they were willing to pay for the system. So I think it’s wise for AATA to start some of the Transit Master Plan’s features as soon as possible. When people see the benefits, they’ll be more willing to pay the cost. Well, Larry, you certainly have the broad vision. I am not an accountant but rather a retired legislator (Board of Commissioners), and my concern is AATA’s ability to pay the bills and keep the buses running in the future. It is my experience that “people” disconnect benefits from additional taxes in many, though not all, cases. A countywide millage has a chance of success, perhaps. But as I indicate, there is a gap between the election and receiving that revenue. What “people” will pay to keep it running meanwhile? And then there is the governor’s earthquake. Next post.